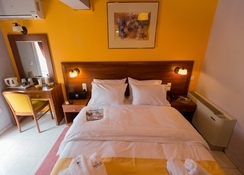 Enjoy a sun filled value holiday in Kefalonia by booking your stay at the comfortable and pleasant Mirabel Hotel. 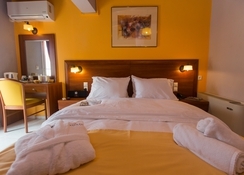 The Mirabel Hotel is located in the charming summer resort of Argostolion on the south side of the Ionian Islands. 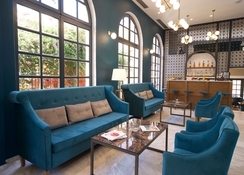 Just 500 metres from the Archaeological Museum, this is a great hotel for couples and families with a wide range of shops and restaurants nearby and 33 attractive guestrooms in a 3 storey property. Guests of the Mirabel Hotel can discover marvellous beaches and explore delightful little village, party in the lively night time atmosphere of Argostoli and relax in front of the most beautiful sunsets nature has to offer. 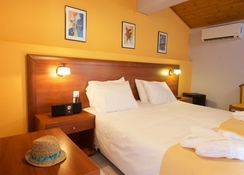 For a bargain holiday in Kefalonia this hotel makes the grade! Kefalonia Airport is 7 km from the Mirabel Hotel. Local Tips: Sports and hobbies, such as walking, running, cycling, beach volley, windsurfing, fishing and diving are available at all of the beaches in the area. The facilities at the Mirabel Hotel offer everything you need for a relaxing holiday. Food, drink and entertainment: There is a café and bar as well as complementary buffet breakfast. There is a television in the lobby. Sports, games and activities: Lush green gardens, nearby beaches, nearby swimming pool and plenty of watersports, fishing, tennis, volleyball, mountain biking and more. 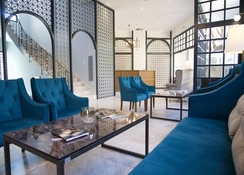 Additional: 24-hour reception with safe box and fax facilities, air conditioned public places, airport transportation (with charge), wireless Internet access, 24-hour room service, tour assistance.